Find hotel near Cenotaph Of Maharaja Bhak .. The cenotaph is a monument of love. It was built by Maharaja Vinay Singh, son of Maharaja Bhaktawar Singh in his father’s honor. This is also known as Moosi Rani ki Chhatri, named after one of the mistresses of Maharaja Bhaktawar Singh. Moosi Bai is said to have performed Sati by jumping into the pyre of her husband in this place only. After this incident, she was given the status of a Queen. This monument is built outside the main palace. It is a two-storey building made of red sandstone. It is based on many small white marble pillars. There are also many domed pavilions on the ground floor. A line of tanks known as ‘Ghats’ surrounding this building along with houses of local families. The ceiling of the dome is decorated with inscriptions from The Ramayana and The Bhagavad Geeta. Inside the building there are raised footprints of the couple covered with flower petals and candles left by the visitors, especially women who come to pray over here. There is also said to be a small hole, from where water is taken out for prayer purposes. The remaining of some beautiful sculptures and paintings of horsemen and other blue and gold geometric motifs. Shoes should be opened before entering the cenotaph. The road connecting the monument is not in a good condition. You can enjoy the view of the City Palace while resting in the shade of the monument. INR 10 per person for foreigners. 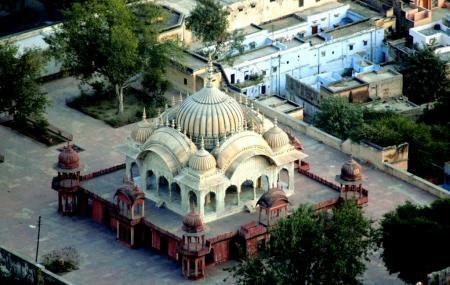 How popular is Cenotaph Of Maharaja Bhaktawar Singh? People normally club together City Palace and Late Night Shopping In Alwar while planning their visit to Cenotaph Of Maharaja Bhaktawar Singh.